Surrounded by sparkling blue water, Palm Oasis near Maspalomas in the Canary Islands is a beautiful location to enjoy time with friends and family. These Canarian colonial style units are nestled among tropical gardens, palm trees, and amazing flowers. Peace and tranquility abound throughout the island and a free shuttle to the beach is available for your convenience. These Gran Canaria timeshares for sale offer studios, suites, and one and two-bedroom units at Palm Oasis. Depending on the size you choose, the rooms will sleep from two to six people and provide a full kitchen with ceramic stovetop, refrigerator and all the utensils you need to make a meal. Units also offer air conditioning, large bathrooms, television and free Wi-Fi. Many units also feature a balcony or patio to enjoy the enchanting views of the island. 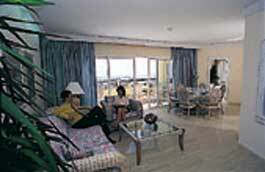 There is plenty of room for everyone with comfortable furniture and a tropical atmosphere. On-site amenities are some of the best in the area. Heated outdoor pools with waterfall and water slide offer fun for guests of all ages. The restaurant serves delicious buffet style meals as well as barbecue nights for family interaction. Adults will especially enjoy the poolside bar and spending a few hours in the evening at the disco bar will offer relaxation and fun. Take advantage of the tennis courts and mini-golf at the resort and stop at the quick and convenient supermarket for some snacks or everything you need to create a wonderful breakfast. Maspalomas is a great vacation destination and with Gran Canaria timeshares for sale, you can locate a wonderful property to get away and have some fun. Close to the resort, guests can enjoy casino gambling, fishing, boating, and a variety of water sports. You can go shopping at the quaint boutiques and walk around town enjoying the beauty of the island. There are restaurants available to entice all appetites and sample local cuisine. The weather is beautiful and you can enjoy making memories with family and friends any time of the year. Contact Palm Oasis Specialist Today!